This page contains several recent observations that could not be grouped into a common content. Some of them are extensions of previous posts. Note: This page contains animations of .gif formats when put together have a size of around 35 MB. So it might take a while for all the animations to load depending on your internet connection. Thanks for the patience. 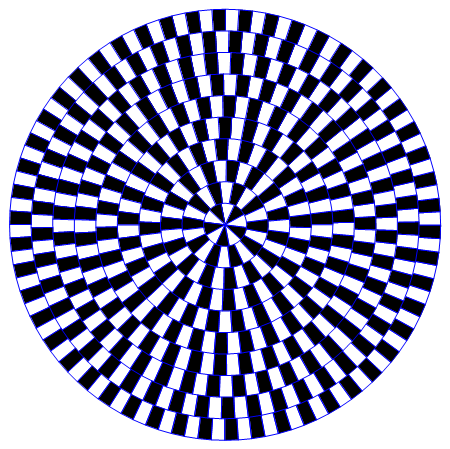 The image that has been presented below is a set of concentric circles that have been made to rotate in the opposite directions. Considering that the the colors are alternating it appears as thought the circles are crooked or not prefect even-though the are. This is simalar to what has been shown in the post named Illusions. Even though what you see are perfect circles. They look twisted because of the alternating patterns of white and black colors. This will be a post with the lines too, like the many on the blog. The ideas are pretty simple, take a geometric object, make it into a set of points instead of a continuous line. Lines can be drawn from one set of points to other and when the right geometry is chosen and if the set of the points are animated, they will give rise to interesting animations. Let us look at some sample images. This can be extended to many more circles in conjunction to make the following patterns. Let us see some. Doing just for the fun of it! Great job! As always very creative work!! You can make small videos and post it on Youtube to teach people all these tricks. You can probably earn something, if not at least recognition. In my case, I made a protein simulation and posted it on youtube, very recently I was contacted by a graduate student from UCL.